We have different type of refrigerators that can be classified to the Passive coolers and active coolers. When we don’t need input power for a refrigerator it is called passive coolers and if we need input power we will call them the type of active coolers. Active coolers use closed thermodynamic cycles to transport heat up a temperature gradient to achieve lower cold-end temperatures at the cost of electrical input power. 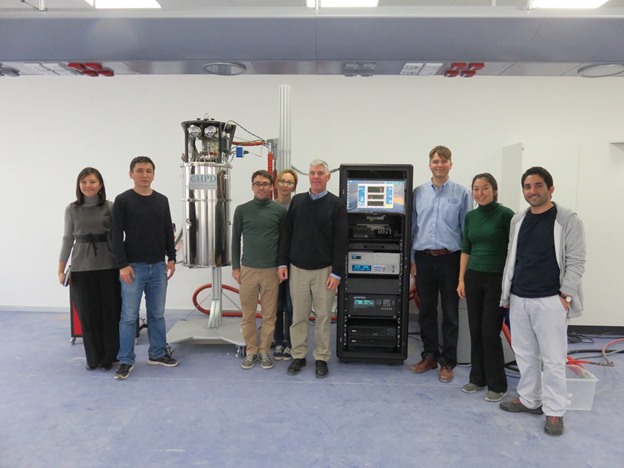 ECL cryostat consists of Pulse tube and ADR (Model 106 Shatsa from HPD company). Figure 1 shows internal view of this refrigerator. It has 4 different temperature levels for doing experiments. Fig. 2. 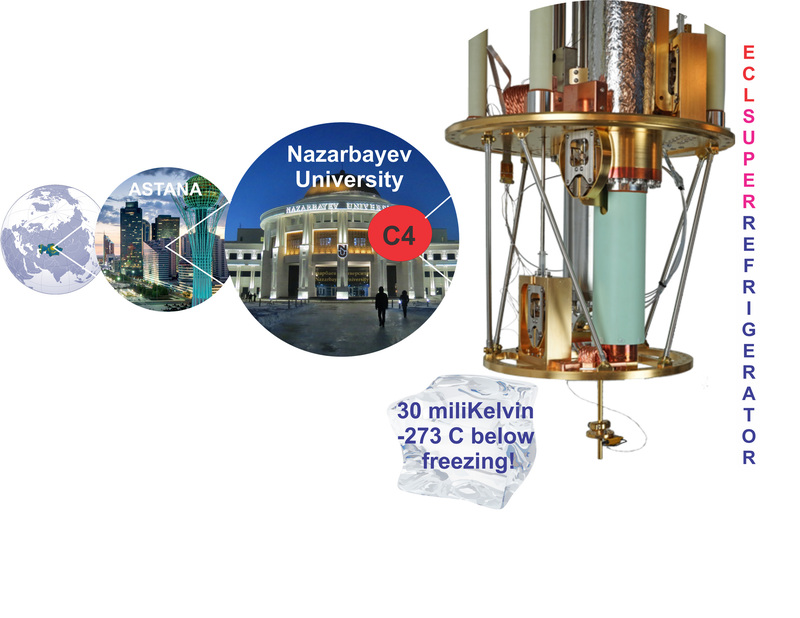 Analogy between magnetic refrigeration and vapor cycle or conventional refrigeration. H = externally applied magnetic field; Q = heat quantity; P = pressure; ΔTad = adiabatic temperature variation. Figure 3 shows a series of entropy over R curves as a function of time and magnetic field for a paramagnetic salt pill (in this case FAA). The cycle progresses in three steps. 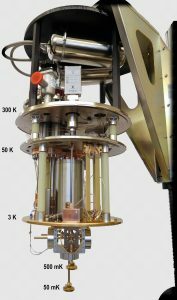 At the start of step one, the salt pill is thermally sunk to the 4 K stage with the ADR magnet at zero field (labeled “Before Mag Up” above). The first step involves isothermally magnetizing the pill from zero field to 4 T ending at the point labeled “At Field After Dwell”. During the second step, after thermally isolating the pill from the 3 K stage by opening the heat switch, the pill is adiabatically demagnetized to zero field reaching the base temperature of the pill (in this example 50 mK). During the demagnetization, heat is absorbed from the surrounding ballast mass spending the energy represented by the area shaded blue. The third step involves either allowing the salt pill to warm up naturally along the line labeled B = 0 T or regulating the temperature of the pill (in this example at 100 mK) by regulating the magnetic field. During natural warm up, the cooling power of the pill is given by the area shaded red. During a regulated warm up, the cooling power of the pill is given by the area shaded in red plus the area shaded in green. 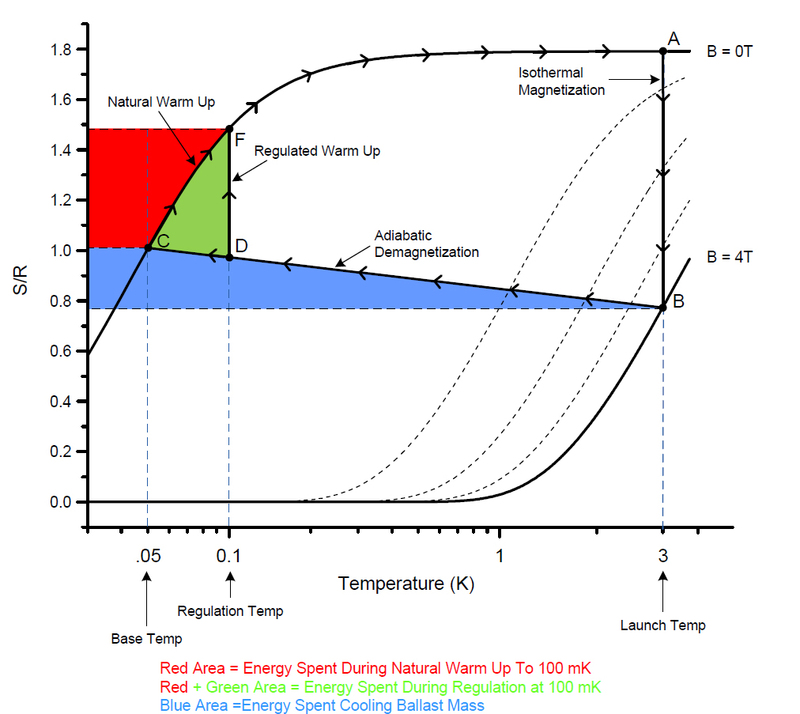 The green area is the “bonus” entropy gained by regulating at a temperature instead of allowing the system to warm-up naturally.